A ceremonial fire outdoors in the amphitheater at Abrons Art Center centering Indigenous protocol and knowledge. Sit by the fire and welcome the evening with neighbors, stories, song, dance, and food (bring some to share). The fire for First Nations Dialogues includes performances by Allison Akootchook Warden, an Iñupiaq new genre artist; Brent Michael Davids, Lenape composer; Dåkot-ta Alcantara-camacho whose work spans ritual activation, performance art, installation, contemporary indigenous movement, and cultural responsibility; and Thomas E.S. Kelly, a Bundjalung-Yugambeh/Wiradjuri/Ni-Vanuatu multi-disciplinary artist and choreographer. Food generously prepared by Quentin Glabus, Frog Lake Cree First Nations from Alberta, Canada and member of I-Collective. Emily Johnson gratefully acknowledges Karyn Recollet’s work in the concept of kinstillatory. 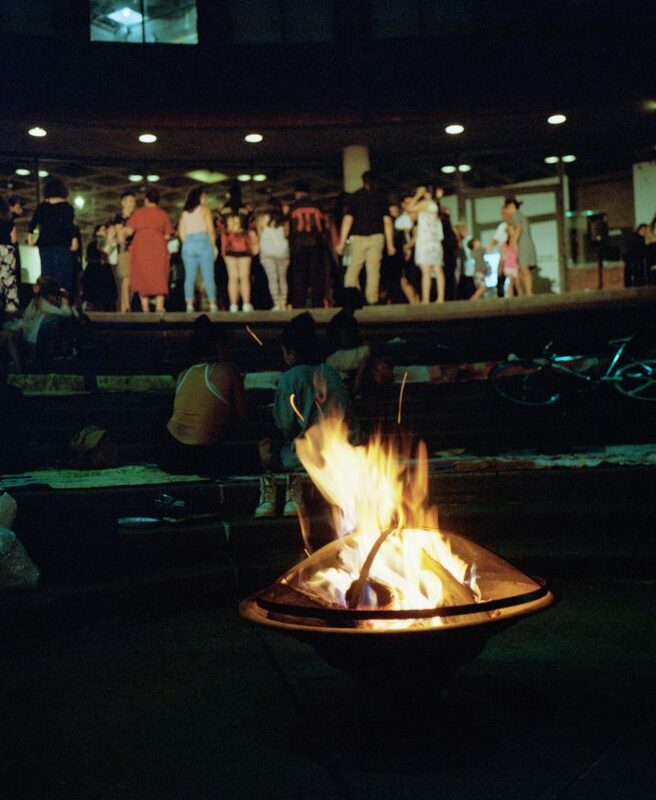 Hosted by Emily Johnson/Catalyst and Abrons Arts Center, join us every month from October to December for ceremonial fires in the Amphitheater that center Indigenous protocol and knowledge. Sit by the fire and welcome the evening with neighbors, stories, food (bring some to share), and dancing. Should there be rain or other inclement weather, the event will be canceled. Please check our website, Facebook and Instagram for updates. Kinstillatory Mappings in Light and Dark Matter was created with funding from The MAP Fund, supported by the Doris Duke Charitable Foundation and the Andrew W. Mellon Foundation.